Last week it was Gartner's turn to look for diamonds in the ashes of the wearable market. This week another tech analyst, IDC, has expressed hope that wearables can flourish - despite the evidence. 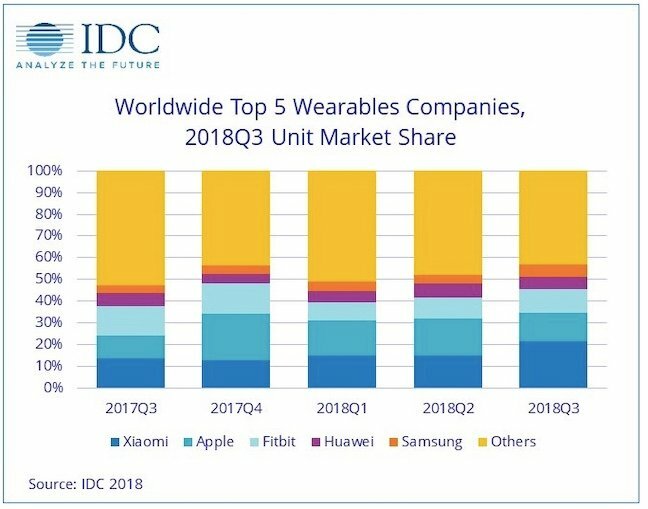 IDC calculated wearable shipments grew 21.7 per cent year-on-year in calendar Q3 to 32 million units - but this double digit bounce was based on healthy demand in one region. The analyst said APAC - which accounted for half of all sales globally - grew 21.4 per cent. Growth, IDC said was partly attributed to Xiaomi's cheap-as-chips fitness tracker being sold in greater quantities outside of China - specifically its push into the vast Indian market. China still accounted for 80 per cent of Xiaomi's wearable sales in the quarter. Xiaomi's Mi Band 3 is being sold for £25 in the UK - it's basically a stocking-filler. In the US, however, the picture was different. Demand actually fell year-on-year, 0.4 per cent - the US is the second largest regional wearable market. Another ominous indicator is offered by IDC: "The reduced price on the still affable Series 3 accounted for the majority of Apple's shipments during the quarter." Under 20 per cent of Apple Watch sales came from this year's Watch 4 series. Nevertheless IDC's Ramon T Llamas saw a glass half full. "The US market – while slowing down – presents an opportunity for vendors to offer more featured and higher-priced devices to current users and possibly to recapture old ones," he wrote. Europe, Middle East and Africa, and Latin America didn't get a mention in IDC's report but El Reg has estimated that the sales growth dial barely registered any movement in the quarter versus the year ago period. Xiaomi led the global sales stakes with 6.9 million units, up 90.9 per cent year-on-year. Apple sold 4.2 million devices, up 54 per cent. Fitbit registered 3.5 million shipments, down 3.5 per cent. Huawei sold 1.9 million units, up 20.3. In fifth, Samsung increased its share to 5.6 per cent on sales of 1.8 million, up 91 per cent year-on-year, this came after the release of the Galaxy Watch, Sammy's first new wearable in years.